For both my boys, Autopia is one of their favorite Disney rides, at least when they were little. Before the most recent trip to Disney World, my sons’ last experienced the ride at Disneyland, when they were young. They were so little that I had to step on the accelerator for them. Both of my boys are now old enough to drive by themselves, so the entire family partook, each in their own car. My older son, seemed somewhat disappointed though. Now that he has a driver’s license and has driven for real, for over a year, he expected to do better, not bumping into the center guard rail. The Disney ride was more challenging than expected. I suspect that the car wobbles naturally, and is designed to be enjoyed casually, and not be perfected, like a video game. I found it challenging myself, to not hit the center rail too, though I do have the excuse of shooting photographs during the entire ride, driving one-handed. 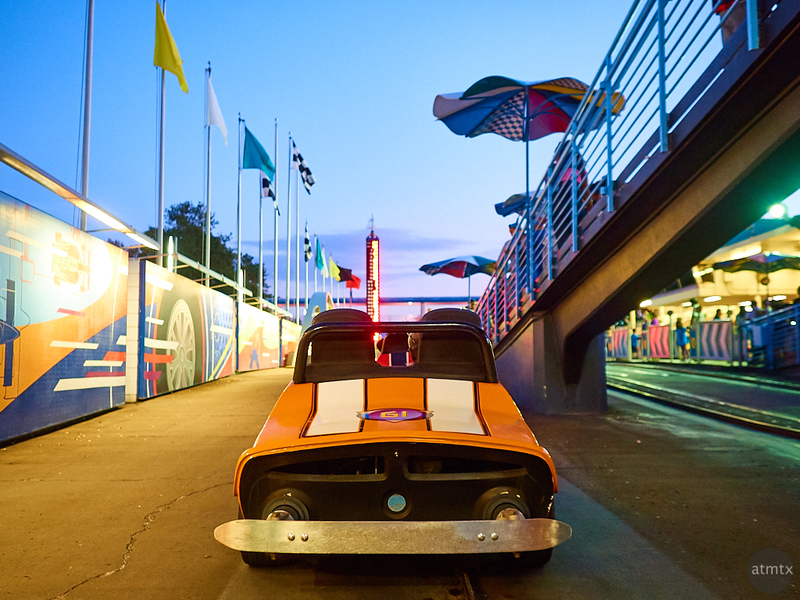 Autopia, as it’s known in Disneyland is called Tomorrowland Speedway at Disney World. Like many things at Disney, there’s a long a detailed history behind the ride, on Wikipedia. I shot this with the Olympus OM-D E-M5 Mark II and the 17mm f1.8 lens. Shallow depth of field and a light vignette for a bit of character.